A heat-transfer device consisting of a sealed metal tube with an inner lining of wicklike capillary material and a small amount of fluid in a partial vacuum; heat is absorbed at one end by vaporization of the fluid and is released at the other end by condensation of the vapor. A device that can quickly transfer heat from one point to another. Heat pipes are often referred to as the “superconductors” of heat, as they possess an extraordinary heat-transfer capacity and rate of transfer with almost no heat loss. a device for transporting large amounts of heat with small temperature differences. A heat pipe consists of a sealed tube partially filled with a liquid heat-transport medium (see Figure 1). In the heated part of the tube (the heating, or evaporation, zone), the liquid evaporates as it absorbs heat; in the cooling part of the tube (the cooling, or condensation, zone), the vapor flowing from the evaporation zone condenses and releases heat. The flow proceeds from the evaporation zone to the condensation zone as a result of the pressure differential in the saturated vapor, which is determined by the difference between the temperature in the evaporation zone and the temperature in the condensation zone. 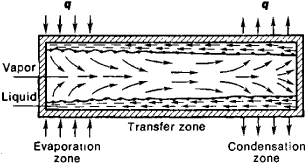 The liquid is returned to the evaporation zone either as a result of external forces, such as gravity, or as a result of the pressure differential of capillary action in a capillary structure installed in the tube; this capillary structure, or wick, is set inside the heat pipe, usually on the pipe walls. Heat pipes with such a capillary structure for recycling the liquid are the most common type because they can operate independently of their orientation in a gravity field and in zero gravity. The effective heat conductivity of a heat pipe—the ratio of the density of the heat flow through the pipe to the drop in temperature per unit of length of pipe—is tens of thousands of times greater than the conductivity of copper, silver, or aluminum and can reach ~107 watts per meter per degree Kelvin. Heat pipes are used in power engineering, chemical engineering, space technology, electronics, and many other engineering fields because of their low weight, high reliability, operating self-sufficiency, and high effective heat conductivity and because it is possible to use them as thermostatic devices. Eliseev, V. B., and D. I. Sergeev. Chto takoe teplovaia truba? Moscow, 1971. The heat pipe, the idea of which was first suggested in 1942, is similar in many respects to the thermosiphon. A large proportion of applications do not use heat pipes as strictly defined below, but employ thermosiphons (illus. a), sometimes known as gravity-assisted heat pipes. A small quantity of liquid is placed in a tube from which the air is then evacuated, and the tube is sealed. The lower end of the tube is heated, causing liquid to vaporize and the vapor to move to the cooler end of the tube, where it condenses. The condensate is returned to the evaporator section by gravity. Since the latent heat of evaporation is generally high, considerable quantities of heat can be transported with a very small temperature difference between the two ends. Thus the structure has a high effective thermal conductance. The thermosiphon, also known as the Perkins tube, has been used for many years. A wide variety of working fluids have been employed, ranging from helium to liquid metals. One limitation of the basic thermosiphon is that in order for the condensate to be returned by gravitational force to the evaporator region, the latter must be situated at the lowest point. The heat pipe is similar in construction to the thermosiphon, but in this case provision is made for returning the condensate against a gravity head. A wick, for example a few layers of fine gauze, is commonly used. This is fixed to the inside surface of the tube, and capillary forces return the condensate to the evaporator (illus. b). Since the evaporator position is not restricted, the heat pipe may be used in any orientation. If the heat pipe evaporator happens to be in the lowest position, gravitational forces will assist the capillary force. Alternative techniques, including centripetal forces and osmosis, may be used for returning the condensate to the evaporator. Capillary forces are by far the most common form of condensate return employed, but a number of rotating heat pipes are used for cooling of electric motors and other rotating machinery. In some applications a mechanical pump is used to return condensate in two-phase run-around coil heat recovery systems. While this may be regarded as a retrograde step, it is a much more effective method for condensate return than reliance on capillary forces. Applications are related to five principal functions of the heat pipe: separation of heat source and sink, temperature flattening, heat flux transformation, temperature control, and action as a thermal diode or switch. The two major applications, cooling of electronic components and heat exchange, can involve all of these features. In the case of electronics cooling and temperature control, all features can be important. In heat exchangers employing heat pipes, the separation of heat source and sink, and the action as a thermal diode or switch, are most significant. A tubular device that is very efficient in transferring heat. Using a metal container (aluminum, copper, etc.) that holds a liquid (water, acetone, etc.) under pressure, the inner surface of the tube is lined with a porous material that acts as a wick. When heat is applied to the outer area of the tube, the liquid inside the tube boils and vaporizes into a gas that moves through the tube seeking a cooler location where it condenses. Using capillary action, the wick transports the condensed liquid back to the evaporation area. See heat sink. A variety of liquids and wicks are used to make a heat pipe, but the principle is the same. The liquid evaporates into a gas that travels to the cooler end of the pipe, condenses back into liquid and returns via the wick. In this high-end TNN500A computer cabinet from Zalman (www.zalmanusa.com), the heat pipe transfers the heat from the CPU to the wall of the case, which acts as a giant heat sink. This combination of heat pipe and case eliminates the need for a noisy fan. 3-5 show the instantaneous variation during each day of the solar time, filling ratio, inclination angle and the hot water mass flow rate of the wickless heat pipe evacuated tube solar collector (HP-ETSC). Heat pipe embedded copper bases are widely used to transfer heat from microelectronics. Each heat pipe has two 90[degrees] bends to get the U shape. A wrap-around heat pipe is a version of a split heat pipe. The single greatest advantage of heat pipe heat exchangers is their ability to contribute to energy and carbon reduction measures in line with a site's decarbonisation strategy. Otherwise, the heat pipe will fail to operate and remove the required heat. Heat pipes, in this case, constructed in flat panels 4m x 400mm, will whisk that away to heat domestic hot water. The thin loop heat pipe that Fujitsu has developed can be installed on a heat-generating component, such as a CPU, in an electronic device so that the heat generated by the component is carried to a relatively cool spot inside the device to diffuse the heat. Heat Pipe Technology Inc is the innovation leader in energy recovery and dehumidification systems for commercial applications around the globe. Heat pipe assemblies, which do not consume any power or contain any moving parts, are an ideal solution for managing heat in medical devices. Diode heat pipes operate by using a reservoir connected to the heat pipe core to control the amount of liquid and vapor in the heat pipe. The paper presents a specific application of fractals, which are used in a heat pipe cooling device.